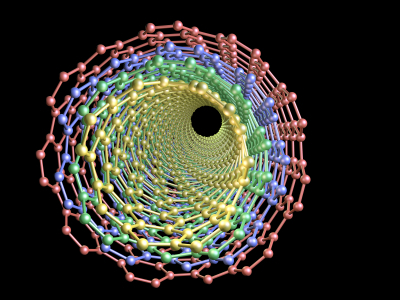 What Are The Future Implications For Carbon Nanotubes Biofuel? « What is Carbon Nanotube Synthesis? Although carbon nanotubes were discovered in 1991 and their implications for science have been deemed many and varied, the use of produced cabon nanotubes biofuel, although proven in some scientific circles, has yet to take hold. Carbon nanotubes were discovered by accident in 1991, when a scientist was using the arc discharge method of carbon synthesis to create fullerenes. While he indeed created the fullerenes he’d set out to produce, he also discovered the production of carbon nanotubes. Because of the natural properties, carbon nanotubes are able to be produced in the lab, but also naturally and it is because of their perfect natural qualities, along with their many unique thermal, electric and additional properties that they are appropriate for creating carbon nanotubes biofuel. Carbon nanotubes are widely popular and widely debated in scientific and research circles because they are feather light, stronger than many other materials—especially stronger than most man-made materials, and because they have some toxic properties in addition to their uniquely useful properties. Carbon nanotubes have the ability to change architecture, the automobile industry, materials science, the space program and a variety of activities and products associated with daily living. These nanotubes are able to be produced on industrial mass scales and the commercial production of carbon nanotubes through synthesis make them incredibly affordable, costing as little as 95 dollars per gram at present—with the price going down every year—making them a uniquely affordable in the creation of carbon nanotubes biofuel. At present, many different studies are being performed all over the world to deduce the use of nanotubes in the production of carbon nanotubes biofuel. These studies are using a variety of different biological matter including glucose, hydroxyapatite, porous silicon and even vegetables such as corn and tomato plants. The most popular studies for this biofuel and other implications in agriculture are the Glucose Oxidase studies and those studies involving the use of growing plants, like tomatoes. Biofuel cells are an increasingly popular topic for study, experiment and research in the scientific fields, partially due to the constantly depleting sources of fossil fuels on the planet and also due to the fact that biofuels, unlike fossil fuels, are a completely renewable resource. As long as plants and other biological materials can grow, and grow quickly, biofuels will prove to be a much cheaper and easier alternative for the world. Fossil fuels, on the other hand, while renewable, took hundreds of thousands of years to become what they are today and required incredible circumstances to synthesize that do not all exist today. Most biofuels are made with Glucose Oxidase although many are made with other enzymes or even microorganisms. Carbon nanotubes biofuels are growing in popularity amongst scientists and researches because these biofuels are much stronger than any of those previously studied or created. Because of the unique construction of carbon nanotubes, the carbon nanotubes biofuels that are presently being created are unlike any other biofuel in existence. They may have implications for all present uses of biofuels including, alternative fuel source vehicles, pacemakers, portable energy supplies and even glucose sensors. When carbon nanotubes are used in junction with glucose oxidase to produce carbon nanotubes biofuel, the carbon nanotubes form a covalent bond with the glucose oxidase, creating a biofuel that is not only stronger than traditional biofuels but that also has a high electrical output, making these new biofuels useful for a large number of applications across the practical field of sciences, materials science and even modern day living. What is more interesting at present is the use of carbon nanotubes in increasing the growth in size, quantity and speed, of vegetables like tomatoes. In September 2009, a team of researchers at the Little Rock Nanotechnology Center, housed at the University of Arkansas, used carbon nanotubes to increase the germination rate of tomato plants. In addition, this exposure caused the seedlings to become stronger and grow more quickly. What the carbon nanotubes did for the plants in this study was to become a part of the seed by penetrating through the thick outer shell and bonding with the plant structure. This in turn made it possible for the plants not only to take in more water, but to hold that water, creating a plant that could possibly survive a longer drought period after a long rain fall. Interestingly, although not related to its properties as a biofuel in this instance, the effects the carbon nanotubes had on these plants seemed to make them toxic to fruit flies. The effects and outcomes of this particular study point to carbon nanotubes biofuel as the wave of the future. If carbon nanotubes are able to create stronger, better and more quickly growing plants, their implications for agriculture, especially in terms of creating biofuels, are greater than most scientists could ever have imagined. However, even as carbon nanotubes biofuel becomes more of a reality rather than a possibility for the far off future, there are many implications to consider. If carbon nanotubes are toxic to fruit flies, what might their implications be for human beings? Additionally, it has been reported that wastes from this type of biofuel may have been a factor in the cause of asbestos and other carcinogens in the lungs of some mice. The toxic properties and possibilities that come with carbon nanotubes biofuel should be taken into account. The purpose of using biofuels in our modern world is to help eliminate the dangers that come with fossil fuels. Fossil fuels are damaging the ozone and difficult and expensive to extract and make usable. At this point in time, it seems that while carbon nanotubes biofuels may be less expensive to produce on a mass scale, they are currently as dangerous, if not more so, for animals, humans and the earth than fossil fuels. Research will continue into the development of carbon nanotubes for use in biofuels and other agricultural pursuits and we can only hope that solutions to the toxic properties are discovered long before these biofuels are put into mass production for public and commercial use. This entry was posted on November 2, 2009, 9:34 am and is filed under nanotubes. You can follow any responses to this entry through RSS 2.0. You can leave a response, or trackback from your own site.